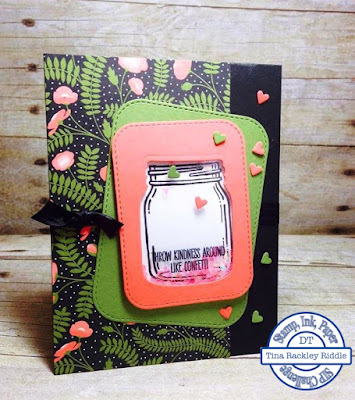 Tina's Crop Shop: SIP Challenge #55 - Sketch Challenge! Hello and Happy Tuesday! I hope your week is fabulous! I enjoyed a really nice long and relaxing weekend with my Hubby. Sometimes it's nice to just do a lot of nothing! lol We did grill out and watch some Cardinals baseball! Jeff and I usually go to a Cardinals game or two each year but last year came and went without a trip to St. Louis at all. We did manage to make a Spring Training game in Florida over the summer though! 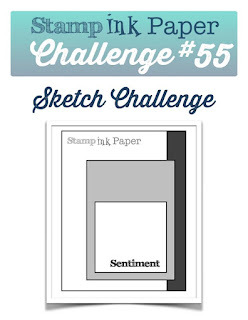 So since it is Tuesday, I'm back over at Stamp, Ink, Paper with my take on a fun sketch! Labels: #55, Everyday Jars Framelits Dies, Jar of Love Stamp Set, Shaker Jar Card, SIP Challenges, Sketch Challenge, Stampin' Up!